This class will help individuals learn to safely join two pieces of metal using MIG, one of the more popular welding techniques. The goal is to take the intimidation factor away and help individuals learn the basics of a valuable and exciting skillset. 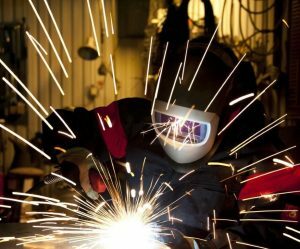 After a basic introduction to safety, the metal shop and its tools, and Metal Inert Gas (MIG) welding, as well as fabrication processes, students may create a small metal sculpture to take home. Students will learn the basics to safely use the metal shop. It is designed to take the intimidation factor out of metal work, while teaching the proper safety and respect for the art and craft of welding and metalworking. By the end you will know what PPE means and you will learn how to MIG Weld! In addition students will gain experience on other common metal shop tools, such as chop saws, band saw, angle grinders, bench grinders, and you will know how to use them all safely. What To Bring: Close-Toed leather or canvas shoes. Long pants of cotton bases material, i.e. Denim or canvas or 100% cotton. No leggings or shorts please. Class price includes a $10 materials fee.